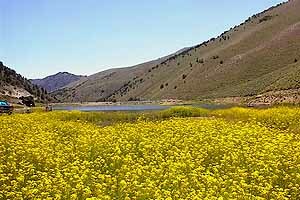 Here’s a weekend excursion into central Nevada that seemed to have a week’s worth of pleasure in it. Our group was husband, wife and 3 children 8 – 12 and we headed east on US 50 on a Saturday morning late in June. Green and prosperous Fallon, thoroughly modern now with an Air Base and chain stores, stands at the eastern edge of civilization. We ate mighty breakfasts at the Stockmen’s on the west side of town and then drove out into Central Nevada, the heartland of the state, where something of the native character can still be found, weather beaten and eroded, but intact. Isaac and Annabelle study human antiquity at Grimes Point. Fabulously enough, the first landmark east of Fallon is Grimes Point, an unexceptional foothill that once overlooked the marshy shore of an inland sea (now you see the air base). For the people who lived here then it was a prime hunting ground and the hunters, or shamans, or somebody else passed the time by pecking and grinding designs into the basalt boulders they hid behind. It is an impressive experience to stand where they stood, yet see a world so different from theirs. . . . Sand Springs Pony Express Station, Sand Mountain beyond. 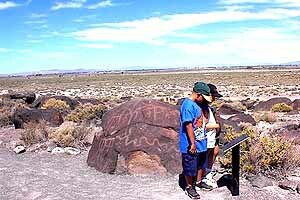 salt flat, where passers-by have left their names and brief messages written in dark pebbles on the white alkali surface. The kids scream out the messages as we flash past. Ahead is Sand Mountain, looking as creamy as custard from a distance, but as dry as, er, sand, up close. We watched the dune buggies scurry up and down the steep slippy sides, bright little bugs buzzing and sparkling in the sun and kicking up sand as they go. And we inspected the crude stone Sand Springs Pony Express Station which has been excavated nearby. We drove south down the east side of the Fairview Mountains (Nevada 361) and admired the earthquake faults from afar on our way to Gabbs and Berlin-Ichthyosaur State Park, a unique combination of preserved Ghost Town and the fossilized remains of swimming dinosaurs. Berlin, maintained in ‘arrested decay’. the abandoned camp of Union and attracted maybe 250 residents while producing something under a million dollars in gold, some silver and some mercury before it closed in 1909. Small scale work continued sporadically until the 1940s. Berlin was acquired intact by the State Parks system in 1970 and is now maintained in a state of ‘arrested decay’ so visitors can experience a ‘true’ ghost town. Yes, it is a managed experience, but it is a great one, and the two hours we spent there seemed like ten minutes. 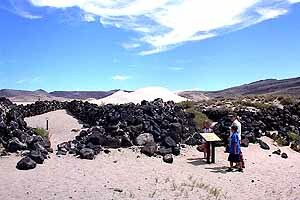 Take the Diana Mine Tour (twice daily by reservation Fri – Sun 4/15 – 10/15, 775-964-2440) if you can. Ichthyosaur with three hors d’ouvres. up Union Canyon from Berlin to the Ichthyosaur fossils discovered in 1928. On your way to the shelter protecting the ancient remains from weather you’ll pass through the old camp of Union, dating from the 1860s and then revived when Berlin began production. 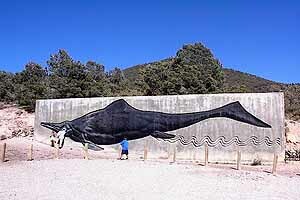 Ichthyosaur was the most highly specialized reptile ever to live on earth, a carnivorous hunger pang the size of a locomotive, and these are the largest specimens known. A park ranger is on duty during the summer season giving tours daily at 10 am, 2 and 4 pm. Ione is just 7 miles north of Berlin, the last old Nevada town of the old frontier, populated not by a resident ranger and his summer assistants, but by 12 humans, 5 horses, 11 dogs and 13 buffalo(!). And while Berlin closes at 5, Ione stays up late. 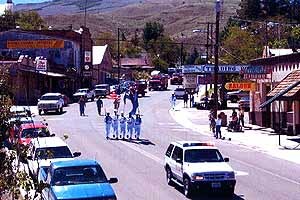 It dates back to 1863, and upon Statehood in 1864 Ione became the first seat of Nye County, a distinction it held for three declining years until Belmont took the prize away. 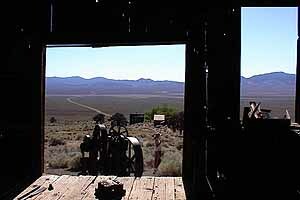 If you have seen the movie Tremors (a great Nevada movie! ), you are prepared for Ione. 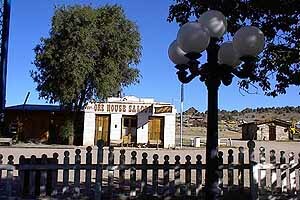 In the movie the only business was a store, here it’s a saloon, with a pool table and a long bar populated by an interesting assortment of customers and presided over by Fly, the celebrated Saloonkeeper from Virginia City, his wife Kathy, and Tony, the local jack of all trades. 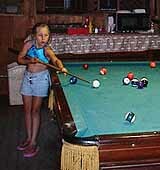 shooting pool and swapping stories in short order. You can stay the night in one of three house trailers, previously miners’ residences, that have been refurbished as rentals, the bullet holes filled, furnaces and swamp coolers repaired. Fly can also arrange a space in the RV Park or a campsite. That’s it for accommodations, so plan ahead and phone ahead (775-964-2003) if you want one. Groves Lake, in Kingston Canyon. perfectly manageable in good weather (be sure you know what to expect before you start out). On your way up the east side you’ll see a complex of beaver dams in a soppy green wetland, and coming down the west side you’ll pass Groves Lake, a favorite trout fishing spot. At the increasingly substantial community of Kingston we turned north on Nevada 376 and west on US 50 over the Toiyabes again and down the east side into Pony Canyon and Austin. activity: The Silver State Grill is newly opened with period decor and a modern kitchen. The new Trading Post makes a lavish show of jewelry, Native American goods and antique bottles. The Main Street Shops will occupy a suite of storefronts across the street where Carol’s Country Kitchen once reigned supreme, and T-Rix Mountain Bikes in the old Lombardo Turquoise building in Upper Town has added ‘& Specialties’ to its name because of the soaps, lotions, fizzy bath salts and other products they sell. Espresso and Italian sodas too! It’s great to see old Austin with some color in its cheeks and a sparkle in its eye.